The Dawn simulator also known as Sunrise alarm clock or even light alarm, allows to reconstruct and synchronize biorhythms by the use of progressive light intensity omitting the aggression and stress of the more traditional forms of alarm (alarm clock, radio) which more often render the first tasks of the day difficult and un-wanting. Whether adult, child or even for babies, sunset and dawn simulation are ideal for a natural and gentle rhythm to falling asleep or awakening. Dawn simulators have been clinically tested – the results of which show that cortisol secretion (hydrocortisone) is optimized. Cortisol hormone amongst others is responsible for metabolic activity and ensures energy distribution towards the brain at the start of each day as well as stress inhibition. The dawn simulator is also used for regulating babys’ sleep, helping it to differentiate between night and day and regulating its biological clock. What is the difference between light therapy and the Dawn Simulator? What is a Dawn Simulator Alarm Clock? The dawn simulator regulates our biorhythms by helping to determine night and day. This allows at night to fall asleep in optimum natural conditions. In the morning, the dawn simulator produces the sunrise effect thus enabling cortisol secretion. Therefore, dawn simulator allows us to wake up naturally and go to sleep rapidly. Bright light therapy is very much different from dawn simulation. This treatment notably allows fighting against all troubles related to a lack of natural sunlight. When light intensity is inferior to 2000 LUX the body naturally secrets melatonin (sleeping hormone) which in turn induces moodiness, tiredness, seasonal affective disorder S.A.D etc… Simply being exposed to an intensive bright light designed sespeciallyfor therapy use, production of melatonin is blocked and normal activity and energy is regained. Our bodies are the result of millions of years of evolution – our industrialized society has existed for only a fraction of that time. Over the millennia our bodies have developed a daily rhythm – the circadian rhythm – based on the rising and setting of the sun. We are sensitive to sunlight; the absence or presence of light triggers or suppresses the release of hormones such as melatonin and serotonin that affect our sleepiness and our mood. This is one reason why some people feel depressed during the winter months. Such depression is known as a seasonal affective disorder (SAD). In a milder form, it is sometimes called the “winter blues”. In modern society, the natural rhythms of night and day are ignored. More and more life goes on 24×7. As individuals, we wake and sleep in line with the demands of the job, not our bodies. We fall into bed without necessarily feeling tired then get rudely awakened by a shrill alarm. Is it any wonder that so many of us are tired and irritable? Sunrise alarm clocks – also known as body clocks, dawn alarm clocks, and dawn simulators – are one way of tackling this problem. In essence, a sunrise alarm clock is simply an ordinary alarm clock complete with a computer controlled fading light. This is effectively a dawn or sunrise simulator. The timing of the light is usually adjustable, allowing it to gradually fade down at night and fade up again in the morning. Even when you are asleep, the body can still sense the changes in light levels. The simulated sunset and simulated dawn thus reproduce a natural nighttime sunset and pleasant morning sunrise. 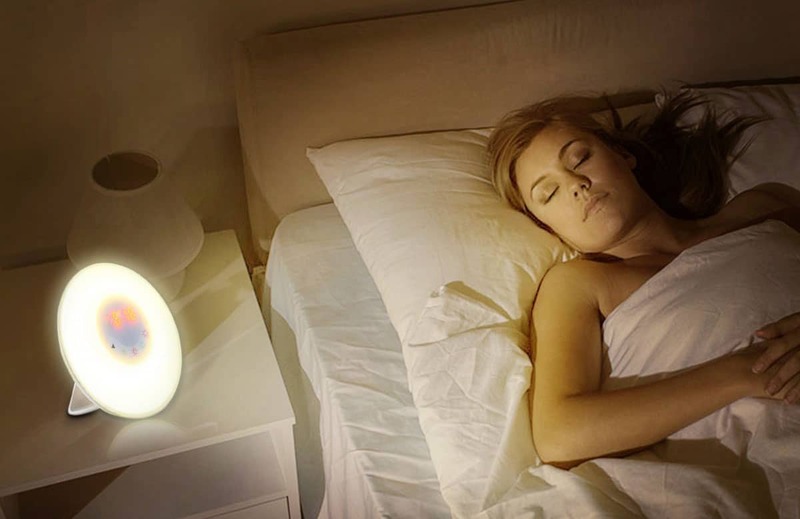 The result for many people is better sleep where the simulated dawn provides a more gentle awakening than being jarred out of sleep by the alarm. A dawn simulator clock can thus be thought of as being a “gentle alarm”. There are many different makes of sunlight alarms to choose from, some well-known brands include Soleil and Biobrite. As well as the basic dawn simulation effect, some more advanced models available to buy on the market include features such as radios and white noise to mask external noise at night. The Soleil Sun Alarm even has an optional extra unit to allow it to control an external light. Speaking personally, I’ve used a dawn simulator sunrise alarm for some while now and wouldn’t be without one. For me it really works – I usually find myself waking up gently and naturally a few minutes before the set time. I can’t remember the last time I needed the audible alarm to wake me up. Often known as Winter Blues or S. A. D. (Seasonal Affective Disorder) is due to disturbed internal biorhythms, often resulting in moodiness, insomnia, an excessive gain in appetite (weight disorders), lack of energy, irritability, and lack of libido, all of which can be naturally reversed by regular exposure to a specific source of bright light – the intensity of which must be between 2500 and 10 000 lux (measure of light intensity). The positive effects of light therapy are appreciated even beyond the Winter season, by all those who work hidden from a natural source of sunlight (e.g. dark and badly lit offices) and also by those who work on night shifts. Light therapy simply consists of regular exposure to strong light from medically certified* Light therapy – luminotherapy* – lamps, or also by wearing regularly the Luminette* light therapy shades. Do You Know the Different Types of Bed Frames That Have You Spoiled For Choice?